As much as possible, we try to spend the night in official campgrounds. But on occasion, we find ourselves in less populous areas where neither campgrounds nor hotels are an option. In these instances, we look for spots of green on Google Maps that indicate public land or parks where we can inconspicuously pitch a tent and not risk trespassing on private land. One dusky evening, we found ourselves looking for green spots on the map and spied Fountain Bluff, a geological anomaly in the Mississippi floodplain between Carbondale, IL and Cape Girardeau, MO. This island of sandstone sporting 200′ cliffs in an otherwise flat expanse was once the bluff buttressing the western shore of the Mississippi. At some point in its meandering history, the river chose to bore a new channel and carved Fountain Bluff off from its neighbors. In spite of the waning light, the rocky monolith loomed clear in the distance and beckoned us closer. Skirting the bluff near its base, I craned my neck to see if the cliff might be climbable and was surprised to see silver glinting that indicated bolted climbing routes (there’s climbing in Illinois, believe it or not!). Farther along, I spotted a faint footpath receding into the thick undergrowth and decided to see whether it led anywhere promising. With my headlamp shedding a narrow column of light, I scrambled up a steep slippery incline to the base of the cliff. I reached a broad flat sandy patch with traces of footprints indicating that we were not the first people who had come hear in search of a campsite. The traces of human activity made me wonder whether this portion of the cliff contained climbing routes as well. Sufficiently satisfied that the sandy patch would accommodate our tent, I turned my headlamp toward the cliff. It was evident that the face in front of me was, in fact, the rear wall of a wide shallow cave. Tracing the contours of the cave, my beam glanced across an unusual shape. When I redirected the light, I saw a large bird shaped like a cross next to a smaller bird. I studied the figure for a few moments not quite sure what to make of it. I moved my light again and saw another figure. 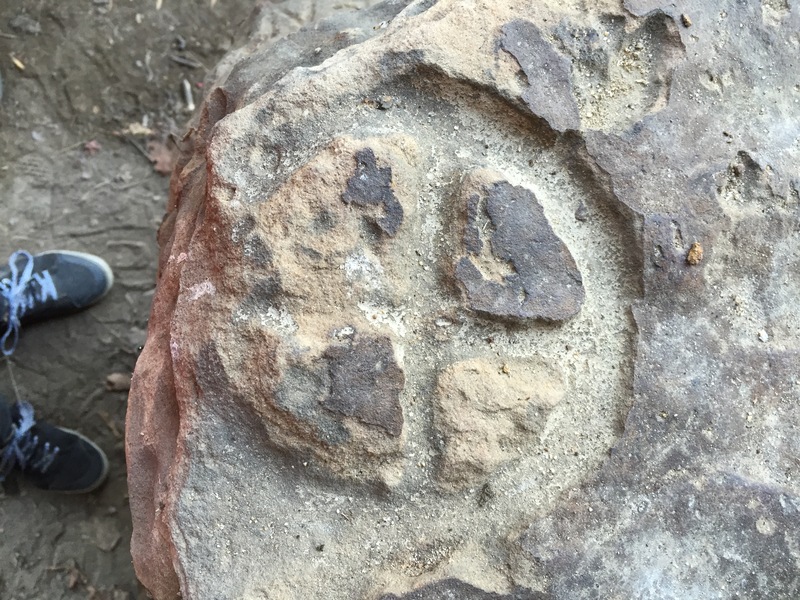 This time, it appeared to be a large deer and another animal, possibly a dog or a horse, facing off with a quartered circle between them. At this point, it dawned on me that I might be witnessing something more significant than some neerdowell’s chiseling. 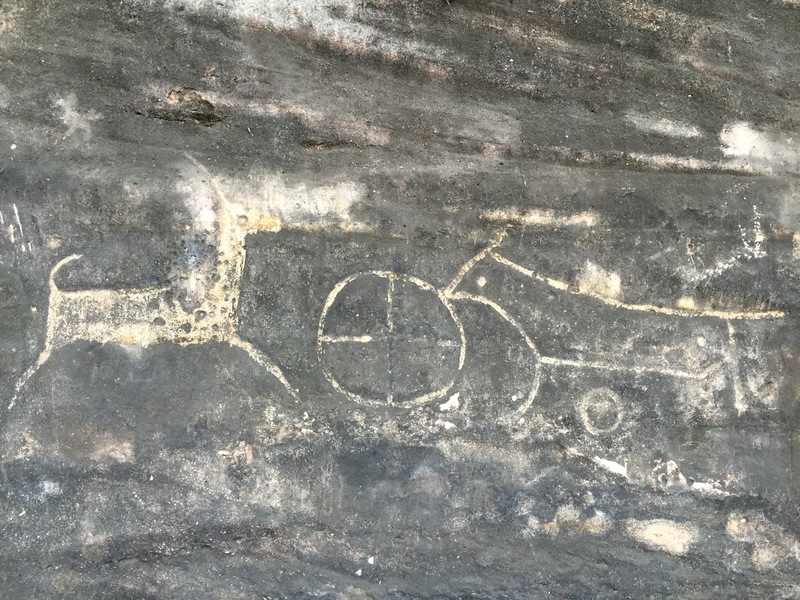 Sweeping the beam all over the cliff face revealed a dozen more figures ranging from hand prints to other animals and symbols that looked ancient in origin. 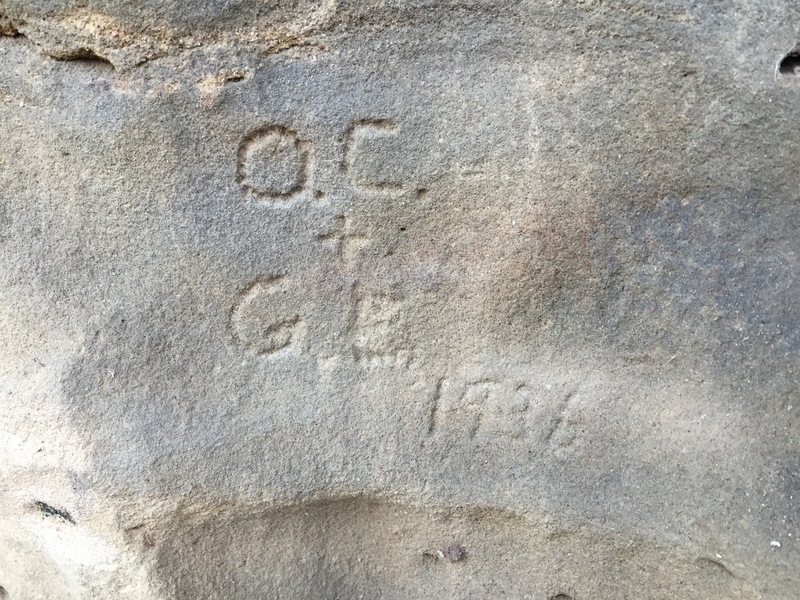 There was also a handful of more modern initials and carvings, including one from 1936. 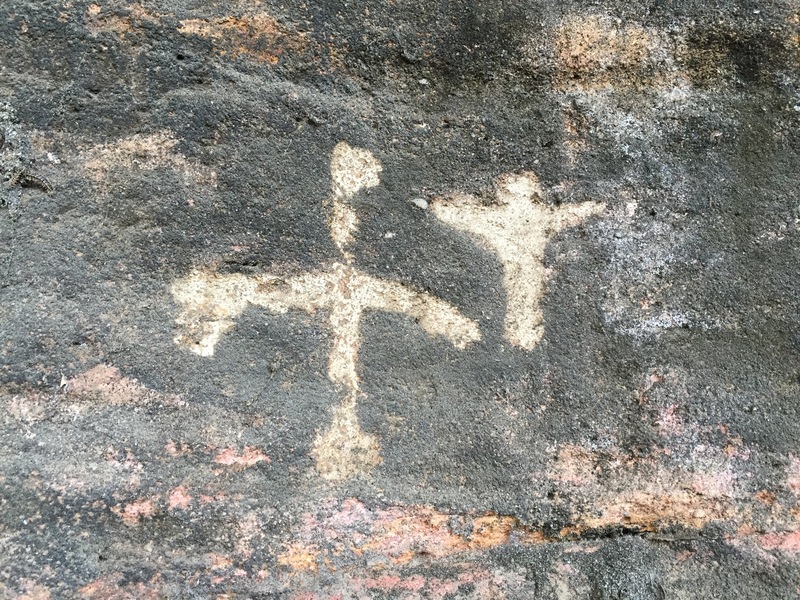 The more I studied the figures, the more certain I became that these were Native American petroglyphs. 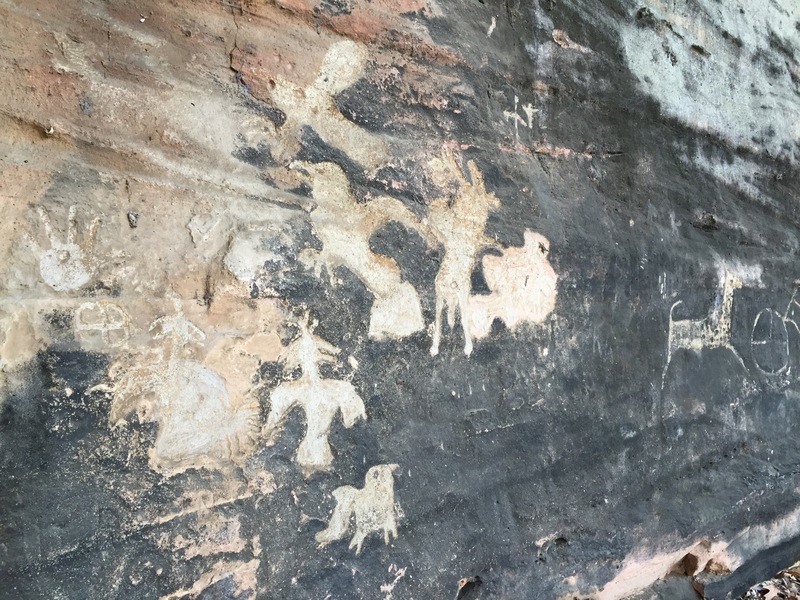 Eager to learn more, we scoured the Internet for any information regarding the Fountain Bluff petroglyphs. 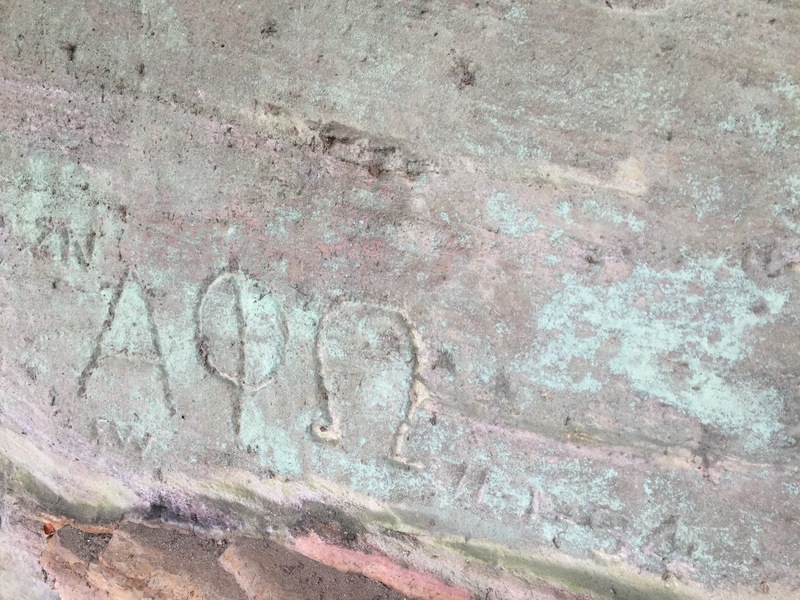 Research revealed that these petroglyphs were first “discovered” in 1954 by local archeologist Irvin Peithman who enlisted boy scouts and members of the Alpha Phi Omega fraternity to help clear the area of brush and document the petroglyphs (hence the Greek letters). The petroglyphs are estimated to date back to between 1,000 and 1,250 CE, during which time the mound-building Mississippian Culture flourished across what is now the Midwest, Eastern and Southeastern United States. Evidently, this place was not just a destination for travelers in search of shelter but also a special place where the original inhabitants of this land expressed themselves and communicated between the ages. Pretty cool! Hopefully the two of you are staying warm and ahead of the stormy weather! Ride safely! Ooops! 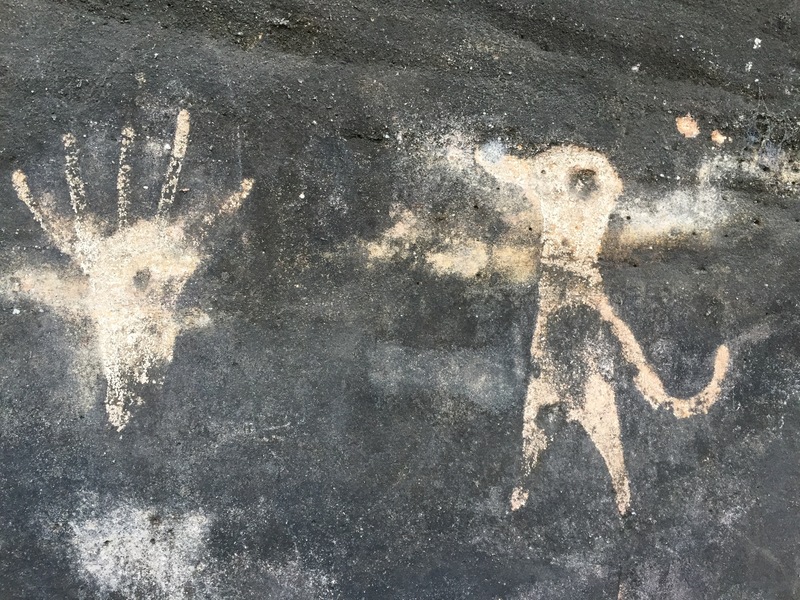 I thought I left a message but I think I didn’t…the petroglyph bird you mentioned looks a lot like the “knife wing” that we have in Northern New Mexico!